Intent: Service LMG for Sith Empire's Legion. 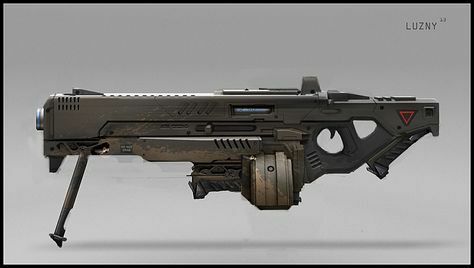 Auto-firing mechanism: The weapon could be set to fire on it's own in different modes: horizontal arc firing, vertical arc firing or even more complicated firing patterns. Particle beam bolts: The explosive power of the bolts is something to be afraid of. It can deliver absolutely lethal damage to a live or not live target, while also making it almost impossible to defend against with a lightsaber as blocking the bolt would result in a low-yield burst. A perfect suppresive weapon. Burdensome: Odd to carry. Affects negatively agility and mobility. A standard particle beam light machine gun capable of delivering 700 bolts per minute in rapid fire. The destructive power of this weapon has often dubbed it by Legion members as 'Shredder' due its capacity to shred things into a bits due to bolt's explosive power. It is able to provide great suppressive fire and can be easily utilized by a single person since it's a LMG. On the other hand, rapid firing drastically decreases its accuracy and increases its possibility to overheat. If the latter occurs, the LMG requires at least 10 seconds of cooling to work again. Stiletto Company, 42nd Airborne Division.